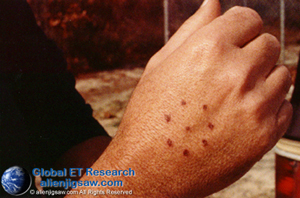 Scoop mark scar on arm of AE (abductee-experiencer); circa 1966. 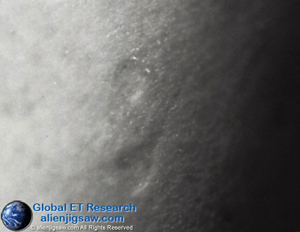 Two tear-drop shaped scoop marks over shin of AE (abductee-experiencer); circa 1967. 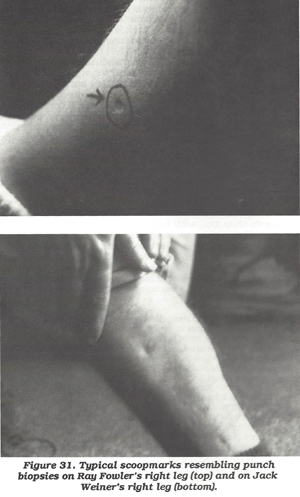 V-Shaped or triangle shaped bruise formed by several “dots” or punctures. 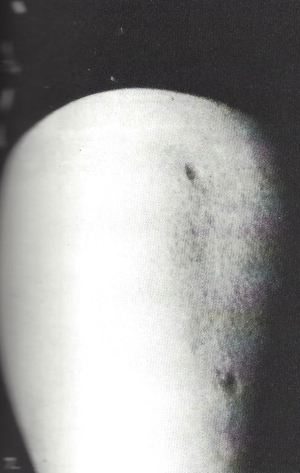 It cannot be seen in the photograph, but with magnification, a circle could be seen inside the triangle bruise formation. Location: Under left arm. Subject is right-handed. 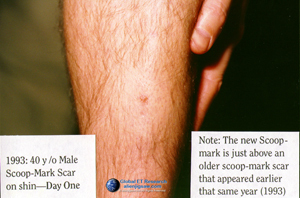 Day One: 40 year old male with scoop mark scar over shin. The newer scoop mark is just above an earlier one that appeared after an abduction encounter earlier that same year; 1993. The same male AE showing the scoop mark in the image above, but eight days later; 1993. A different AE with what some refer to as an “eraser” type bruise, called so because it looks like it was made with the indentation of a pencil eraser. These bruises are also unusual in that they are not painful or sore as a normal bruise feels; 1994. 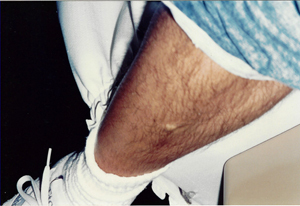 The same AE as pictured above and after the same encounter showing where a device was placed over his legs to restrain him; 1994. This AE worked with Budd Hopkins after being interviewed and vetted by a MUFON investigator. 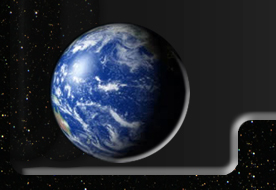 The same AE as above. This mark appeared overnight after an encounter. This is a rare photograph depicting a center mark surrounded by seven identical marks. As far as we are aware, only one other AE has described a similar marking on their body and that AE resided approximately 3000 miles away from the AE in this photo. 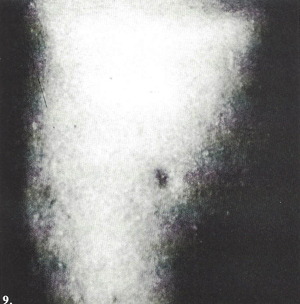 Another post abduction body mark that is circular with a straight line coming out from the center. This unusual post abduction bruise appears to have overlapping bruises with a center area that remained red after quite some time. 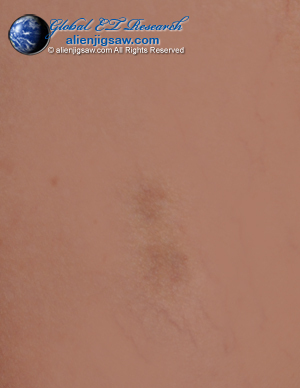 A different AE with what some refer to as an “eraser” type bruise, but this type is much larger and appears to have areas inside that show needle marks and/or white areas, i.e., non-bruised areas. These bruises are also unusual in that they are not painful or sore as a normal bruise feels. 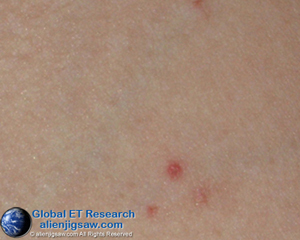 When these bruises eventually fade, they leave behind very small, faint areas similar to age spots; therefore, a dermatologist would never suspect anything unusual unless the AE visited a physician immediately after the encounter occurred. 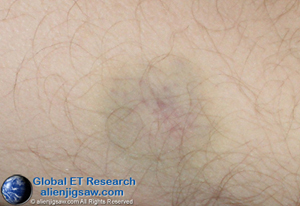 The same post abduction bruise as above, but enlarged. 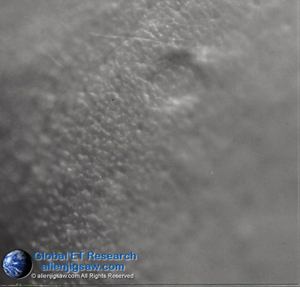 Although it remains unclear, it is suspected these marks are caused by the often reported wand type device that may be used for stunning the AE and/or for tissue sampling. A different AE with a pinpoint triangular marking, post abduction. 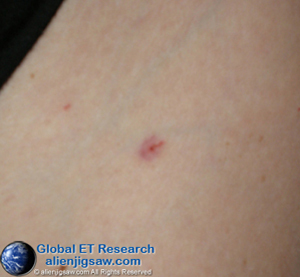 The same AE with a pinpoint triangular marking, post abduction; enlarged. 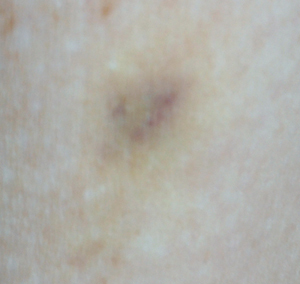 A similar bruise as shown in images above, but with needle like markings inside. 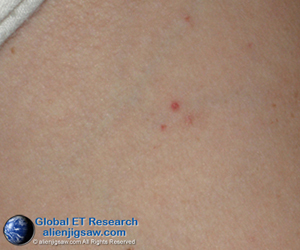 These most often occur on the inside portion of the upper arm. 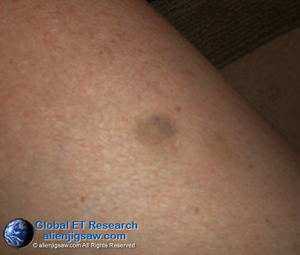 A different AE with a variation of the common post abduction bruising. Note the four separate bruises grouped together. This individual is a retired physician. An unknown object just under the skin of an abductee-experiencer, c. 1994. The object moved when pressed with finger, c. 1994. 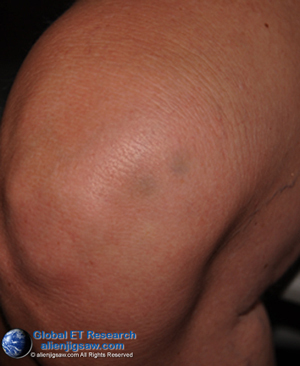 The following two images show two post abduction bruises. The one on the right is older and is fading while the one of the left is more recent. As mentioned previously, these types of post abduction bruises leave behind small, faint spots similar to age spots. If you look carefully, you can see two others in close proximity that have faded into small spots. The two small spots, which were previously as large as the two large bruises pictured here, are to the left of the red circle and above and to the right of the darker bruise. A different AE with two identical post abduction bruises, side by side, on their knee. 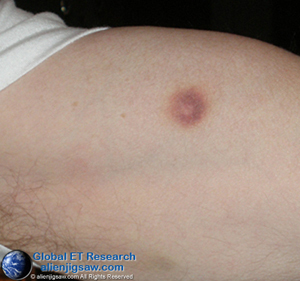 The same AE with the common bruise with a circle inside. The faded area to the right and below is an earlier identical bruise. Apparently the abductors use the same locations frequently. 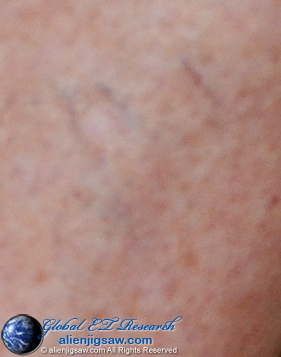 At least one AE was told they use the same areas so as not to create additional or noticeable scarring or bruising. A severe, larger bruise with an elongated circle inside. The AE did not engage in any physical activity that could have caused such a bruise, especially in this location. They simply awakened with it. Three Dot V-Shaped Marking on the neck of a male AE. Scoop Mark Scar on the back of a male AE using the alias “Nick.” One of Budd Hopkins’ AE subjects not mentioned in the text of Intruders. 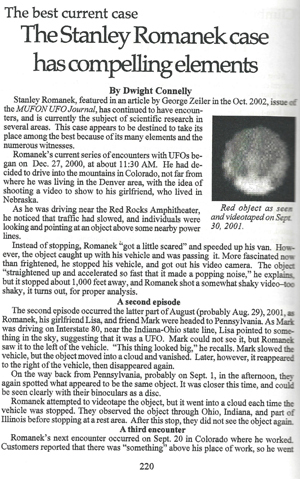 Stan Romanek’s Case: Five circular marks that appeared after an abduction. The Stan Romanek Case and related book, Messages, has received wide positive acclaim. To the left is the opening chapter from former MUFON Journal Editor, Dwight Connelly’s book, The World’s Best UFO Cases (2004) Bookseller, Inc.
Purple stains that appeared immediately following an abduction experience by a male AE. The stains did not fluoresce under UV illumination. The subject did not drink red wine or use any chemicals the prior day or the prior evening of the encounter. 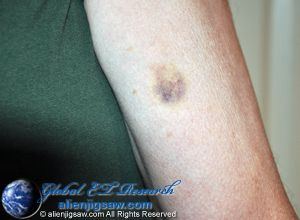 Bruises showing the aftereffects of three fingers (a hand print) pressed into the bicep of an abductee-experiencer. This photograph was taken the morning after the encounter occurred. 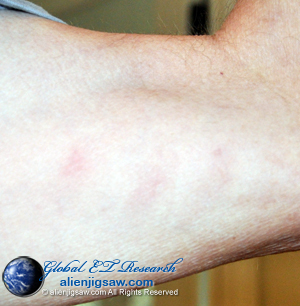 Light Enhancement Only: Bruises showing the aftereffects of three fingers (a hand print) pressed into the bicep of an abductee-experiencer. This photograph was taken the morning after the encounter occurred. 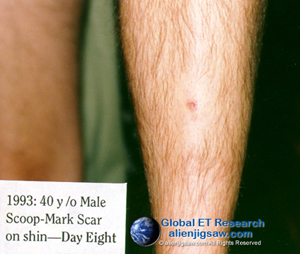 A purple mark underneath the skin or possible biological implant that appeared on the shin of an AE overnight following an ET encounter that was believed to have “MILAB overtones” as described by the AE. A large, matte-silver triangular craft with a ribbed exterior was seen. The large triangle craft appeared to be escorted on its left rear flank by approximately five military helicopters. Same purple mark underneath the skin or possible biological implant with light enhancements only. Mark has remained on the shin of the AE for over three months. A different AE with what some refer to as an “eraser” type bruise on the bicep. This photograph was taken very early on; only a few hours after the encounter occurred. 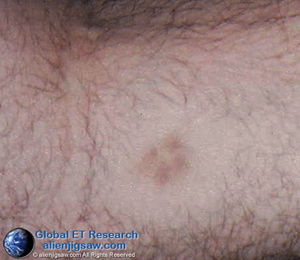 Double bruises on the inner thigh of an abductee-experiencer. Although this photograph was taken immediately after the encounter in 2014, we just received a copy of it, so we are including it here in our 2015 updates. It is not as clear a representation as we would like, but its location and the “double bruising” are a common feature of post abduction body marks. ET Abduction [or possible MILAB] involving lumbar spinal procedure, most likely the ET [or MILAB] version of a lumbar puncture or “spinal tap” during which at least one female alien human hybrid was seen and with whom telepathic dialogue occurred. “Others” were in the room with the AE and they were reported as similar in appearance as the female hybrid. “Telepathic…shortish dark hair…” Her expression was described by the AE as “serious” and “stone-faced.” There was also bruising along the spinal column the AE said did not photograph well. There is a needle mark inside the raised, more traumatized portion of skin. Close-up of needle mark inside the raised, puffy portion of the wound. 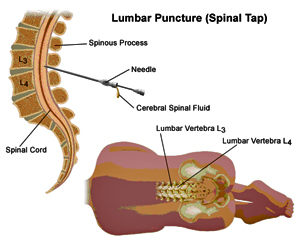 ET Abduction involving lumbar spinal procedure (most likely an ET [or MILAB] version of a lumbar puncture or “spinal tap”). 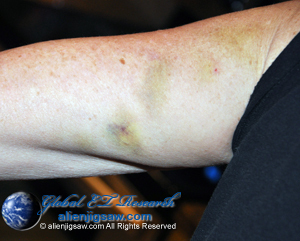 While the bruise and wound do not look severe, the pain the AE was left with was described as nearly debilitating. The AE said they had difficulty walking, experienced headache, muscle weakness, and leg pain for many days. Five days later the needle mark was still visible, as was the bruise. Debilitating pain was still reported at this stage. Fluorescence on thumb following alien abduction procedure related to spinal tap. Neither soap nor scratching or scraping the skin had any effect on the area of fluorescence for 48 hours. Fluorescence near knee following spinal tap procedure. 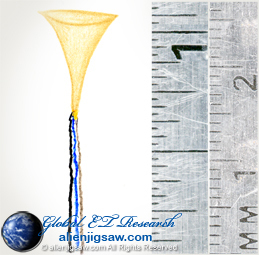 The AE (abductee-experiencer) described this mark as a “light or chemical implant” but it’s probable this was a chemical used during the medical procedure. Neither soap nor scratching or scraping the skin had any effect on the area of fluorescence for 48 hours. 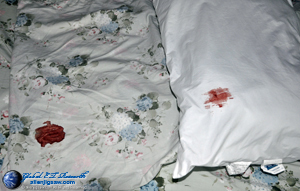 Bloody pillowcase (left) and pillow (right) immediately following an abduction event. The blood came from the AE’s ear. It is not known what type of procedure was done to cause the bleeding. Subject has severe bilateral hearing loss due to life-long abductions. 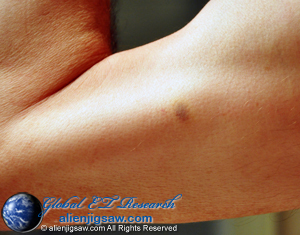 Bruise on bicep of AE (abductee-experiencer). Notice the four dot bruise pattern. A similar type of bruise occurred on a retired physician’s arm several years ago (scroll up to view image). 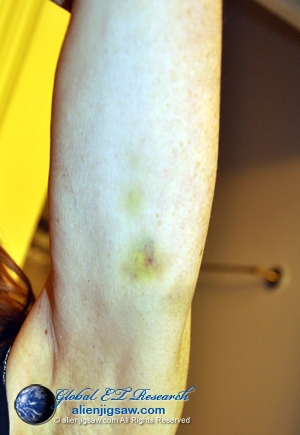 The same four dot bruise pattern two days post abduction. 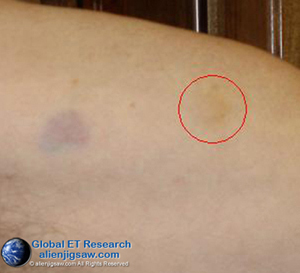 Erasure type bruise on bicep of AE (abductee-experiencer). When these eventually heal or fade, they leave behind very small freckle like marks. A dermatologist would not recognize them as anything unusual. 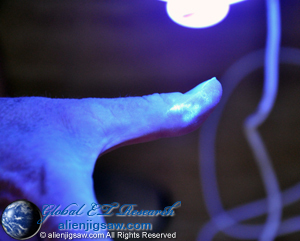 Fluorescence on left wrist of AE (abductee-experiencer) - post abduction. The following two images are of fingerprint bruises with at least one puncture or possible claw mark on each set. 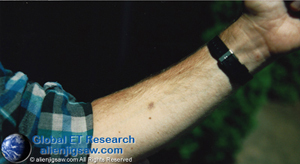 The top photo shows six apparent “fingerprint” bruises on the AE’s inner right arm, which may indicate the ET was six fingered or grabbed the AE twice, causing the bruising. 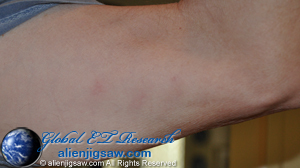 This second photo shows the AE’s inner left arm with four apparent fingerprint bruises. The AE believed the experience involved a male Reptilian or Reptile appearing type of ET. The AE remembers being pulled downward, while standing, through the floor of their home with their spouse next to them. They described the effect as floating downward, possibly underground or through solid matter into a different “space” or realm. 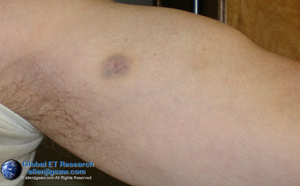 This is a red, indented, slightly “scoop mark” type bruise which appeared immediately following an abduction experience. The area was described as “very sore for several days.” Eventually, the scoop mark indentation returned to normal as the bruise faded about a 1-1/2 weeks later. 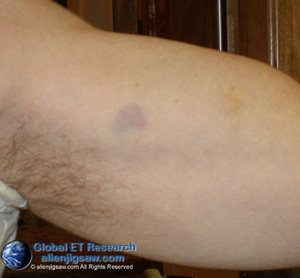 Left inner arm of male AE showing a severe bruise immediately following an abduction encounter. 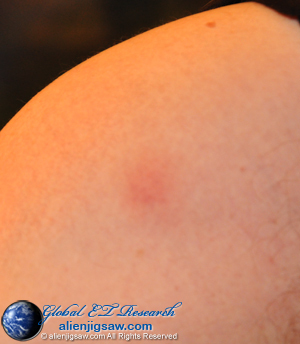 Bruise is larger than it appears in the photo, and according to the AE, measured approximately 1 – ¾ by 1 – ½ inches. You can read more about the nature and causes of fluorescence body marks and post-abduction body marks at the links below. 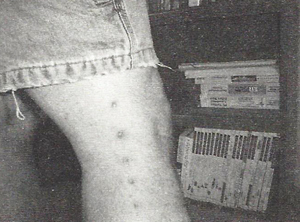 What types of devices could be creating these post abduction body marks and why are such procedures performed? 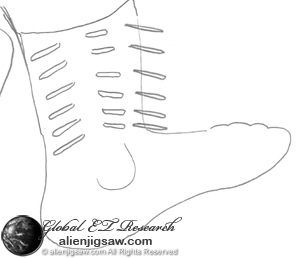 A different type of DNA transference device that was inserted into the shin bone of an AE. See image below. These three images are from the late Dr. Karla Turner’s book, Taken: Inside the Alien-Human Abduction Agenda (1994). 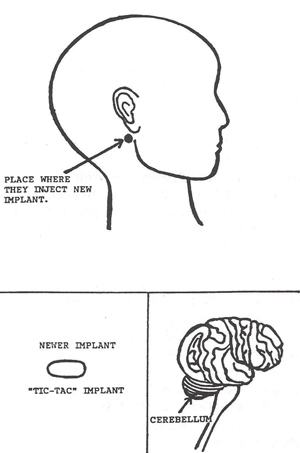 These two images are from the late Dr. Karla Turner’s book, Taken: Inside the Alien-Human Abduction Agenda (1994). This image depicts what two other implants looked like. Notice the similar dendritic-like appendages coming off of both implants that are similar to the ones in the image below. It is probable these implants are nanotechnology and possess intelligence. Detective prosecuting Stan Romanek now facing felony charges for lying in another case.